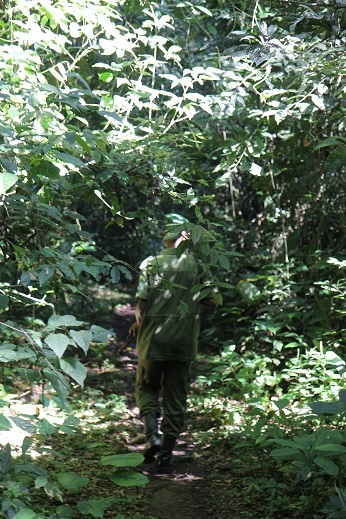 ICCN rangers conducted over 468 foot patrols, covering 15,130 kilometers in the Reserve, removing over 3,168 snares, arresting 145 poachers and evacuating 930 illegal miners. 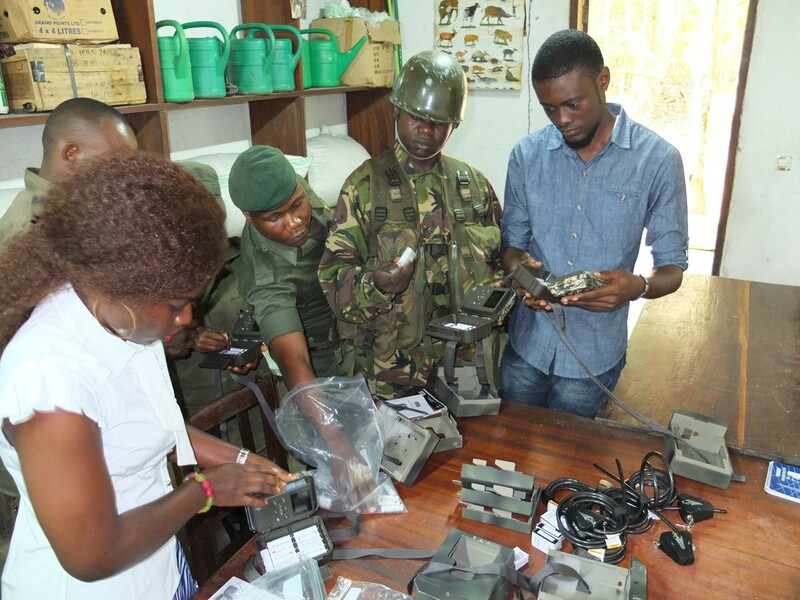 The rangers destroyed 50 poaching and mining camps, and confiscated equipment and contraband. The first Women’s Group in Mungbere (Northern area of the OWR and the 5th such group) was organized, which along with the other Women’s Groups continues to receive OCP conservation education, administrative support, sewing machines and materials and seeds for community gardens, all in an effort to support small business enterprises that empower women. OCP agronomists continued their efforts to expand their programs, responding to strong interest among farmers in all areas of the Reserve. New farmers joined the program as farmers move on to become self-sufficient, with OCP supporting about 500 farmers in the program at any given time. This effort works to reduce slash-and-burn agriculture intrusion into the Reserve and deter the participation of residents in illegal activities. 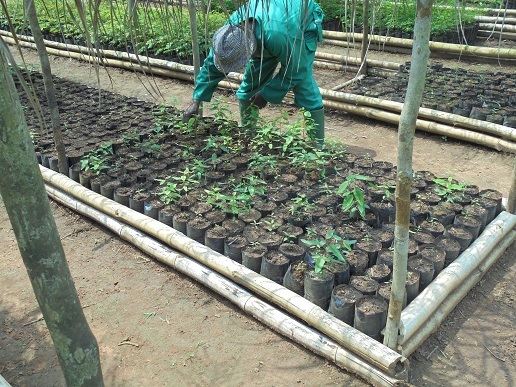 39,656 tree seedlings were distributed to farmers as part our agroforestry program to increase their crop yields and to students to reforest abandoned fields. Staff constructed and operated a new nursery in Niania in 2017 to better serve the west side of the Reserve. This brought the number of OCP nurseries producing tree seedlings and vegetable seeds for distribution to four. A fifth nursery is planned to be built in Wamba in 2018. From late February to early March during the first of two dry seasons during the year, 10 OCP educators traveled on motorbikes over 640 km (400 miles) on rough dirt roads to make presentations to 57 secondary schools located in and around the Okapi Wildlife Reserve, interacting with over 3,500 people. On our trip to DRC in March, 13 additional camera traps were brought to Epulu giving us a total of 17 camera traps. The additional camera traps will permit us to document the presence of okapi and other wildlife in more than one area at a time. On April, OCP was able to assist with the closure of a gold mine in Bapela, done in conjunction with the ICCN and local customary chiefs. On July 14, 2017, an unidentified group of armed men attacked a group of rangers and 3 journalists doing a story on illegal mining inside the Reserve, and four rangers and a porter were killed. Virunga National Park graciously sent reinforcements and scent dogs to assist with the search for the attackers, and a plane to safely evacuate the journalists. ICCN remains in control of the mine site and the Congolese army continues to search for the perpetrators. In honor of our 30 year anniversary in June, OCP launched a ’30 Years in 30 Days’ marketing campaign to raise awareness of the project, educate people about the endangered okapi and raise funds for our mission. 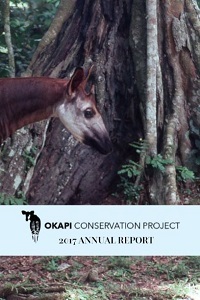 Over the past 3 decades, OCP has never faltered for even one day on its commitment to protect the okapi and the animals that share its forest home. Sadly on June 19th Marcel Enckoto, Okapi Conservation Project’s Assistant Director and Director of our extensive community education program, succumbed to cancer. M’Monga Kiete who was being mentored by Marcel was appointed Education Coordinator in November. As part of a commitment to provide training to the employees of ICCN and OCP, OCP supported a motor vehicle training course in Goma for two drivers based at the Epulu Station. Between ICCN and OCP there are eight vehicles and thirty-four motorcycles that are used to cover the expansive area of the Reserve. A new generator arrived in Epulu in November after a circuitous trip from Goma through Rwanda and Uganda to avoid the dangerous roads in Eastern DRC. The generator will power ICCN Headquarters and the OCP field office, supplemented by a solar system on sunny days. The second World Okapi Day was celebrated on October 18. For 2017, OCP organized parades and races in the territories of Mambasa, Epulu, Niania and Wamba. 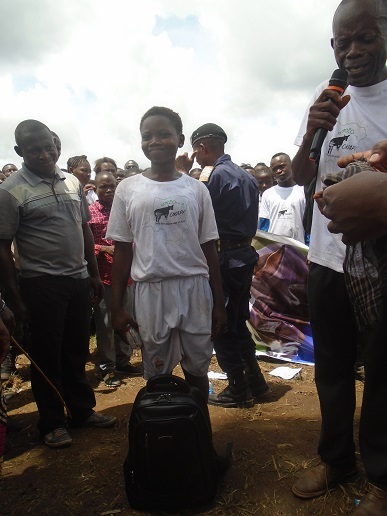 The day featured local teens racing for World Okapi Day prizes, all relating to furthering their education. During the summer and fall eight water sources in the OWR were retrofitted with new retaining walls, a concrete apron and steps to improve access, water flow and hygiene. 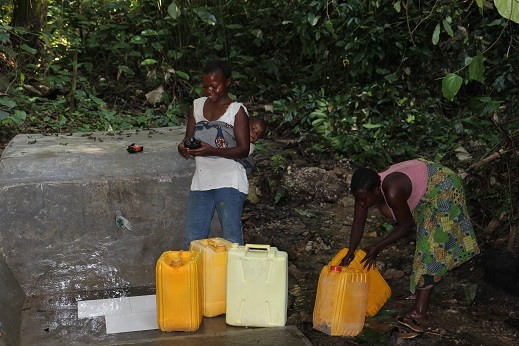 The eight rehabilitated water sources make life easier for over 8,000 people (mostly women and girls) by reducing waiting time at the sources providing them with many more hours in a day to devote to other interests. Thank you for your support over the past year. Join us as we continue protecting okapi and engaging communities in conserving habitat in 2018!